Let's do our household inventory this weekend you suggest to your family. They, of course, immediately groan because that sounds like a drag. Why would anyone take the time and energy to make a home inventory when there are lots of better things to do, like watching paint dry? A home inventory is some type of documentation of the items that you and your family own in and around your home. It can consist of written documents, video, photos, or a combination of all three. But why would you want to make one? A household inventory is most useful to your family if you need to make an insurance claim, such as because of fire, theft, or some other disaster. Have you ever needed to use your home inventory, or encountered a situation where you needed one but didn't have one? Can You Name Every Item Your Family Owns In Every Room Of Your House Right Now? When you are filing an insurance claim something you did not want to happen has occurred. At a time like that, when you are not thinking straight and are in shock, you aren't going to remember everything you owned in every single room. Heck, even on my best day I can't remember everything my family owns. Can You Answer These Questions Without A Home Inventory? How many pairs of pants does your son have? How many spoons do you own? How many boxes of Christmas decorations do you have stashed in the garage, and their general contents? Imagine trying to answer those questions for every single thing in your home, under stress. If you could answer all these questions without peeking at your home inventory you have a better memory than the majority of people in the world! Another reason to create a household inventory is to help you deal with the insurance company without losing your mind. I'll let you in on my own dirty little secret -- in my other life I am an attorney. I deal with insurance companies everyday at work, and over the years I have learned that insurance adjusters are trained not to believe you. They listen to everything you say with complete skepticism. You could tell them the sky was blue, and they would want to hire their own expert to confirm that statement is true. So, creating a home inventory, especially one with photos and video, and copies of receipts can really save you lots of headaches and heartbreak at a time when your family is already emotionally vulnerable and heartbroken from whatever disaster is requiring you to file an insurance claim. Showing an insurance adjuster pictures of your television set puts his or her mind at ease that you, in fact, had a television set that you should get compensated for because it was stolen or destroyed. By the way, insurance companies love receipts and act incredulous that you did not save the receipt for the underwear you bought two years ago and further are incredulous that you are unable to produce said receipt even though your entire house and all its contents burned down. Can you tell that I get frustrated with insurance companies? OK then, I will stop my rant about them, because they do serve a positive purpose. Now, don't get me wrong, just because it is no fun to deal with the insurance company when you need to file a claim, your family still needs insurance. As frustrating as it can be to deal with insurance companies sometime, it is a necessary evil. Why do you need insurance? Because it is impossible for the average family to be able to get themselves back on track and replace even the most basic of their possessions without cash to do so, LOTS of cash. I have seen this over and over in my work -- it is not that you need to buy only designer clothing, or expensive electronics. That is not why you need lots of cash. Instead, you need lots of cash, which is what insurance provides when it works right, because you need to buy so many things all at once, without the luxury of stocking up when there is a sale, or saving up for one item at a time. 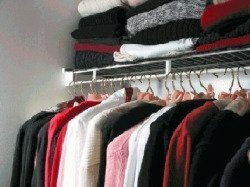 Buying a minimalist basic wardrobe for each family member, from socks and underwear on up, all at once is expensive. Especially, when you also need to buy appliances, replacement kitchen items, and furniture at the same time. Similarly, you do not want gaps in your insurance coverage, such as having only half the coverage you need to replace your families' personal property in the event of a disaster. Do you have enough coverage of the right type?, e.g., replacement-cost coverage versus actual cash value coverage. Do you need supplemental coverage to cover certain types of personal property, such as your large jewelry collection, or to protect against certain types of disasters, such as flooding which is typically not covered by most basic homeowner's policies. It is impossible to remember everything you owned, especially when you are already stressed out from having lost all or part of it. Documentation and proof are essential for the insurance company to full compensate you for your loss. To make sure you are fully covered in the event of a loss before the loss actually occurs and it is too late to buy additional coverage. I hope you and your family never need to use your household inventory. But, a decent household inventory can be created relatively quickly and maintained with just a little effort. It is worth that amount of time and effort in case your family ever needs to make an insurance claim. So, are you ready to create a home inventory? Click here to learn how to create a household inventory quickly and easily, what to include in it, and how to maintain it thereafter. Have You Ever Needed To Use Your Household Inventory, and Why? Most people don't think they need to create a household inventory until it is too late. If you ever needed to use your household inventory, or later wish you had created one because of something that happened to you, please share your story with us. Your story will appear on a Web page the way you enter it here, with only minor edits as needed. You can wrap a word in square brackets to make it appear bold. For example [my story] would show as my story on the Web page containing your story. Do you have a picture to add? Great! Sometimes they really bring home the point of your story. Click the button and find it on your computer. Then select it.